Aaargh! You are a crazy hamster who decided to check the law of gravity and asked other hamsters to launch him high in the air. 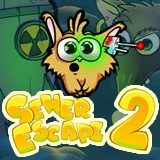 Collect coins and leave the territory of the sewer!